Admission is $3 for adults and $1 for kids, membership is available. Located at 6544 Throup Rd. These three groups have come together under the sponsorship of the EMCS Society to form the SOOKE PERFORMING ARTS GROUP (SPAG). The group includes representation from all of the performing arts groups in Sooke. Its funds are managed by the EMCS Society and held in their Special Projects fund. SPAG's main goal is to encourage local participation in the performing arts by developing and showcasing local talent in a professional performing arts environment and by providing youth with opportunities to experience and participate in all aspects of the performing arts. MICHEL DES ROCHERS, born in Quebec, Canada, is an international artist who has traveled extensively and shown his work in many places. He has and still is creating paintings using mediums such as oils, pastels and water colours. With his wife Marion and son Simon, Michel lived for ten years in the south of France, so is very familiar with the areas we visit. Michel has a wealth of art knowledge which he gladly shares with the students under his care. Irvin Thomas Amundrud was born in August, 1950 at Lloydminster, Saskatchewan, and grew up on a farm along the banks of the North Saskatchewan River in a countryside of rolling hills, grain fields and poplar bluffs. 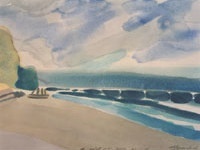 From an early age he was fascinated by the landscape - its textures, shades, and forms. He remembers his Grade One excitement over a friend's Crayola crayons with their many brilliant colours: gold and silver, bright pink and lime green. For his twelfth birthday he got real oil paints, and started formal lessons. At fourteen he was awarded two bronze medals in an international art competition. After two years at the University of Saskatchewan he abandoned electrical engineering and continued with a major and minor in fine art - painting. In 1986 he took up flying, gaining access to a host of new landscapes and a new perspective on the land. In 1990, he quit a college position to work towards becoming a full-time artist. He is an admirer of Tom Thomson and his work is reminiscent of the Group of Seven in its focus on the Canadian wilderness and the grandeur and beauty of the land. This interest has taken him from the Rocky Mountains to the Churchill River, but since moving to the West Coast he has focused on the seashore; the interplay of sea, land, and sky; the light on the water. He often works directly in the field, and his dream is to paint the Pacific Northwest with a float plane as his working platform. He thinks of painting as the language of the artist, and feels with Vincent Van Gogh that the process is spiritual, as described by Paul the Apostle: "Now we have received, not the spirit of the world, but the Spirit which is of God�..expressing spiritual truths in spiritual language." From a note in his diary, while painting water colour on location in June, 1997: "The pigment is transported upon the water, brought together, separated, strengthened and weakened, burnt by the sun, frozen by the cold, mottled by the rain, abraded by the sand, streaked by the wind; and the one who holds the brush is only a witness to these things." Mr. Amundrud's work has been exhibited in public and private galleries and may be found in private and corporate collections. He and his wife Joanna live in the village of Sooke, at the southern tip of Vancouver Island. They have four sons and a daughter. Since most search engines aren't very good at understanding the overall meaning of a page (yet), they look for clues that can help understand the most important parts. They primarily search for clues in the first 200 words of text on your page in addition to examining your HTML meta-tags. Similarity between text on your page and your meta-tags improves the relevancy score.